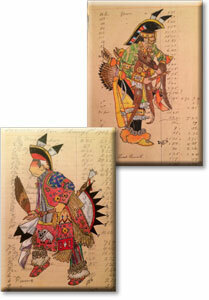 This summer, we’re raffling off a piece of custom ledger artwork drawn from your own image (single person, unframed). This artwork by Mac Colvin is valued at $125. The raffle runs until September 30, 2016. Tickets are $5 each. Please send checks to Tony Haines at the address listed below. Please make your check payable to: National Powwow. Tony will ensure raffle tickets with the buyer’s name go into the hopper. The other half of the raffle ticket will be sent to the buyer upon request. The winning ticket will be pulled September 30, 2016. The winner will be announced on the NPW website and Facebook page, and shipping arrangements will be made at that time. All raffle money will go towards the expenses of National Powwow 2017. We appreciate your generous support!